I grew up on Disney animated movies. For me, the high point was “Beauty and the Beast” before the movies stumbled around for the past fifteen years. Sure, in some cases the art was fantastic, the songs were catchy, or the story heartwarming, but the whole package seemed to be missing something special that would place the latest movie in the same league as “Snow White”, “Cinderella” or “Sleeping Beauty”. I had the chance to see three recent Disney movies in a row: “Tangled”, “Brave” (with Pixar) and “Frozen”. Of the three, “Frozen” came the closest to capturing the Disney magic. The film is based on Hans Christian Anderson’s “The Snow Queen”. Despite it being one of his most critically acclaimed stories, I hadn’t heard of the story it hit the Disney spotlight. True to the Disney tradition, the story borrows selected elements from the Anderson sale, but Disney puts a very Disney stamp on it. The film is computer animated yet heavily inspired by the hand drawn animation style that made the Disney Animation studios famous. 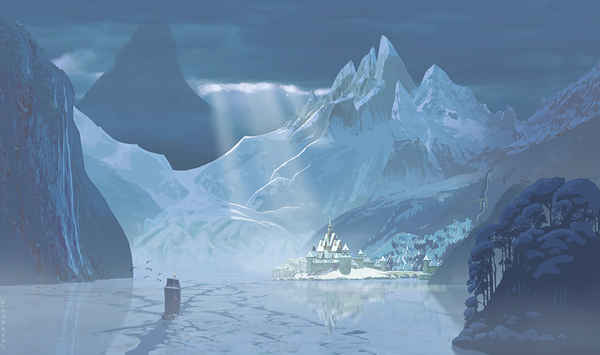 The Norwegian inspired setting helps to create a gorgeous backdrop for the film. The film’s not perfect. From a storytelling perspective, I was a little disappointed that the villain got off with a slap on the wrist. Good can’t triumph evil if all we do instead is learn to get along. The music came close to being timeless, but I wonder if some of the tracks will show their age in the decades to come. Despite these quibbles, the film is a great piece of cinema. If you haven’t seen it yet, go and see it. Author’s note: This review is no way affected by the fact that Canadian Christophe Beck wrote the orchestration nor that the animating team drew inspiration from Quebec City’s Ice Hotel to learn how light interacted with ice.